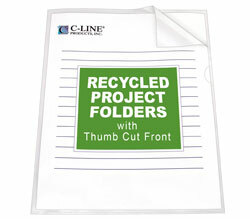 Two-pocket paper folders contain 75% post-consumer recycled material. Portfolios feature two business card slots. For 11 x 8 1/2 document storage. Without prongs. Assorted colors include red, yellow, green, blue, purple, black, white. Minimum purchase quantity is 100 units (one display).